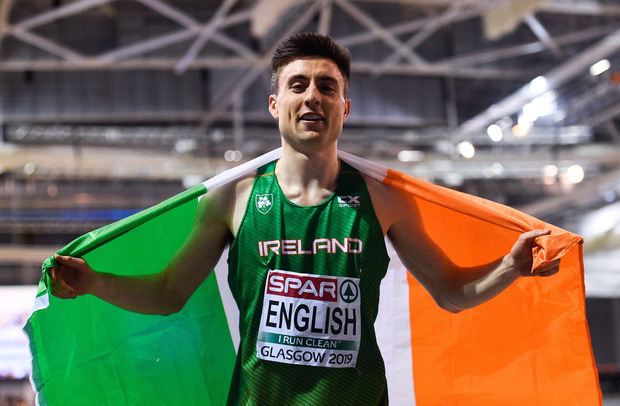 Mark English has won a brilliant bronze medal at the European Championships in Glasgow, the 25-year-old Donegal man taking third place in the men’s 800m in 1:47.39. The race was won by Spain’s Alvaro de Arriba in 1:46.83, with Britain’s Jamie Webb taking silver in 1:47.13. It is the 19th medal won by the Irish since the championships began in 1970, Maeve Kyle and Noel Carroll also getting on the podium during its previous guise as the European Indoor Games. It is the third European medal of English’s career. In 2014 he won 800m bronze at the European outdoor championships and backed it up with silver at the following year’s European indoors. However, the years that followed saw English’s progress sputter to a halt, injuries denying him the chance to truly show his class at major championships. But a trip to Manchester last November for a biomechanical assessment identified key areas of weakness and English has since put together a run of consistent training, which paid off in style tonight. English threw himself into contention from the start of the race, slotting into second place behind early leader Andreas Kramer of Sweden, and going into the final lap the Irishman was sitting third. Despite facing challenges from behind over the final lap he held on bravely to secure Ireland its first medal of the championships. It makes him just the third Irish athlete after David Gillick and Derval O’Rourke to win multiple medals in the 49-year history of the event. “It’s really, really nice to come back and get a medal after four years,” said English, speaking to RTE immediately afterwards.